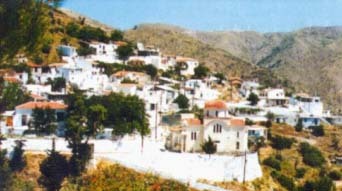 Pispilounta is a mountainous village at the east foothill of Amani, with a view to Pelinneon. Ancient findings from the classical Greek times found in this area are exhibit at the archaeological Museum of Chios. The village church dedicated to Saints Constantine and Helen celebrates on May 21st. Two km southeast of Pispilounta lies the now deserted, medieval village of Tamarkou. Ruins of a castle, tower and houses can be seen around the church of Aghia Paraskevi. The late Byzantine chapel of Virgin (Panagia), once the village church , celebrates on august 15th.